The Integrated Applications Preferences in QuickBooks 2012 aren’t personal, so no options are available on the My Preferences tab. 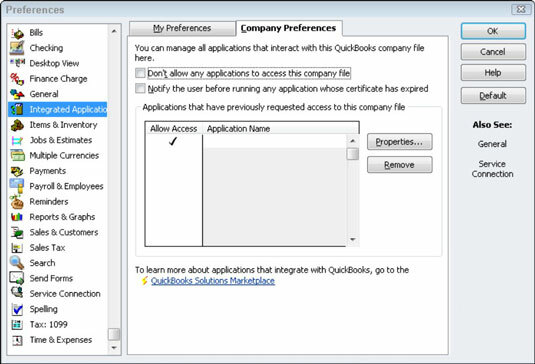 However, the Company Preferences tab for the Integrated Applications Preferences set does control and track other applications, or computer programs that open the QuickBooks company data files. The Don’t Allow Any Applications to Access This Company File check box, if selected, tells QuickBooks that it should not allow other applications to open this company data file. The Notify the User Before Running Any Application Whose Certificate Has Expired check box, if selected, tells QuickBooks that it should not allow any program whose security certificate is out of date to open the QuickBooks company data file without first notifying the user (that’s you). The drop-down list on the Company Preferences tab of the Integrated Applications Preferences set shows the name of the applications that have previously requested to open the QuickBooks company data file. You can remove an application from this list by clicking the application and then the Remove button. You can change the rules or properties that the QuickBooks program applies to access this other application by clicking the application in the list and then clicking the Properties button.